According to Susrutha Ayurveda is auxiliary to Atharvaveda. Brahma created it even before he created man. It consisted of one lakh verses in 1000 chapters. Vaghbhata also follows Caraka & Susrutha and explains that Brahma recalled and revealed it thereby signifying that creation is only the revelation what already existed. Susrutha says that Lord Prajapathi learnt Ayurveda from Brahma, Ashwini Devatas fro Prajapathi, Indra from Ashwini Devatas and Divodasa from Indra. Divodasa from Dhanvantri. From Dhanvantri, Susrutha, Aupadhenava, Vaitarna, Aurabhra, Karaveera, Pushkalavata, Gopurarakshita, Nimi etc. Acharya learnt the science with emphasis on surgery and compiled their own works. According to the Caraka version, Indra revealed the science to Bharadwaja. From Bharadwaja it passed in through Atreya to Agnivera, Bhela, Jatukarna, Parasara, Harita & Ksharapani. Each of these sages made their own Samhitas. According to Kasyapa, Vasishta, Atri and Bhrigu learnt Ayurveda from Indra. They passed it on to their sons and disciples. Study of our medical text books reveal about the progress of Ayurveda. The Ayurveda created by Brahma with One Lakh Stanzas is not presently available. The Ayurvedic knowledge was transmitted from generation to generation by oral tradition. Ashwini Kumaras practiced both medical and surgical treatments simultaneously, by the time of Samhita studies were undertaken in specialized areas. The divisions of knowledge of healthcare into eight parts became possible. Among the Samhitas available today, Caraka Samhita is medicine oriented, Susnitha Samhita is Surgey oriented. Kasyapa Samhita explains about Paediatrics. Caraka Samhitha, Susnitha Samhitha and Ashtanga Hrudaya are considered as Brihatrayees. The Agnivesa Samhitha compiled by Agnivesa from the teachings of Punarvasuatreya and redacted by Caraka is known as Caraka Samhitha. The term Caraka is used in many works on many occasions. Its not possible to assert that there was a particular Acharya in that name. The term Caraka is derived from the habit of wandering. Caraka Samhitha shows special affinity for Atharva Veda. According to some authors Caraka and Patanjali are same, others say that they are different. Sutrastana- 30 Chapters- Deals with fundamental principles of Ayurveda. Nidanastana-8 Chapters- Deals with etiology, pathogenesis and diagnosis of diseases. Vimastana-8 Chapters- Princi[ples governing bodily factorsd that cause disease- drugs and medicaments. Indrreyastana-12 Chapters-Deals with prognostic signs of symptoms. Chikitsastana- 30 Chapters- Treatment of diseases. Kalpastana-12 Chapters- Formulation for emesis, Purgation etc. Siddhistana-12 Chapters- Principles governing the administration of elimination therapies. Charaka Samhitha might have been written between the periods of Panini and King Kanishka. It was clearly written before the time of Vagbhatta, because Vagbhatta has mentioned many subjects of Caraka. So, the period of Caraka can be concluded between 1st and 2nd Century B.C.Drudabhala was the final editor and presented the existing Charaka Smahita in complete form, it happened around 4th Century A.D. Initially Ayurveda was described in three types- etiology, symptoms and treatment. The diagnostic methods were improved by a deeper understanding of concept of pathogenesis. He has explained the different ways of examination through palpation and percussion. He also gives emphasis on patient’s clinical examination- digestion capacity, psychological status, constituton. For the exchange of knowledge and removing doubts, seminars and conferences proved to be useful. From the time of Charaka, a tradition began to arrange seminars and on-going symposiums. Various renowned Ayurvedic physicians used to participate in these seminars. Charaka has made various references of these seminars. For the first time Charaka explained the concept of bioenergetics in a detailed and scientific manner. Furthermore, he also explained other principles as Panchamahabhuta Theory and Rasaguna Veerya Vipaka Theory etc. in the section of medical treatment Charaka described rejunevation treatment to strengthen immunity as the first and foremost part of any treatment. He also explained the importance of clinical and practical knowledge, in addition to theoretical knowledge, in order to become successful as an Ayurvedic physician. Charaka for the first time mentioned that medicines are not merely for treatment of diseses, but they are meant for restoring homeostasis. Charaka Nyasa- Bhattara Harischandra-4th Century A.D.
Charaka Panjika- Swami Kumara- After -4th Century A.D.
Nirantarapadavyakhya- Jejjata- 6th Century A.D.
Ayurveda Deepika- Chakrapani- 11th Century A.D.
Tatva Chandrika- Sivadas Sen- 15th Century A.D.
Jalpakalpataru- Gangadhar Sen- 19th Century A.D.
Charakopaskara- Yogendranath Sen- 20th Century A.D.
Charaka Pradipika- Jyotischandra Saraswathi- 20th Century A.D.
Period is considered to be 12th Century A.D. 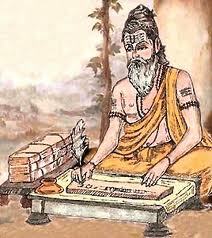 Originally Acharya Sushruta composed the text “ Sushruta Samhita” and later on Nagarjuna redacted it. It contains 120 chapters which are distributed in 5 divisions. Uttara Tantra- 66 Chapters is believed to be an addition to the original text written by Nagarjuna. Sushruta Samhita formulates the theory of cosmic evolution, which is a close parallel to Sankhya Darshana. He clearle states that fertilization will take place by the union of sperm and ova, but, it is not sufficient for creation of life. In adition to this involvement of superior agency is necessary. Tridosha theory of Ayurveda was dealt by Sushruta in detail in three different aspects such as, physiological, pathological and therapeutic. He explains various aspects of sleep and blood circulation process and also explains surgical procedures in a systematic way, i.e. pre-operative, operative and post-operative measures. Preservation of dead body was also explained. Training, duties of physicians, surgeons and nurses etc. have been explained in detail. Chikitsa Sthana- 24 Chapters.Kalpa Sthana- 8 Chapters. Vrudha Vagbhata compiled important topics from Charaka and Sushrutha Samhita and also added new important topics in a systematic manner to form Ashtanga Sangraha. In Sutra Sthana new plants are mentioned specific to diseases. The relationship between diseases and tridoshas is explained. For the first time it is stated that even toxins, after processing can be used to treat diseases. In the chapter of Aphrodisiacs a new theory of Application of medicated paste on feet is introduced.this book was composed by Vagbhatta without adding or deleting anything to the ancient especially treatises of Ayurveda. Actually many critics are written but, today, only one out of them is available. It is Shashilekha written by Indu. Sharir Sthana – 6 Chapters. Chikitsa Sthana – 22 Chapters. Kalpa Sthana – 6 Chapters. Uttar Sthana – 40 Chapters. Ashtanga Hridaya is the most popular and applied book, because of its concise and poetic presentation. In this book many plants are mentioned specially for particular diseases. For ex: Musta for Jwara, Haritaki for Vata and Kapha. The concept of vipaka is very well defined. Many new drugs are introduced as rejuvenators and Aphrodisiacs. Ashtanga Hridaya is not an independent treatise but is a edited compilation of the best from Charaka and Sushrutha Samhitas.the approach to describe disease entities is also very good. Diseases are described under different headings – Nidhana, Purvaroopa, Roopa, Samprapti, Chikitsa, Aushadha, Aahaara. These Samhitas are considered as Bruhatrayees. Saarangadhara Samhita, Bhavaprakasha and Madhavanidhaana are considered to be Laghutrayee. Saarangadhara is the author of the Samhita. The whole Samhita consists of three divisions, 32 Chapters and 2600 verses. Purvakhanda consists of 7 chapters, deals with the types of medicinal formulations, examination of the pulse, processing food items etc. Uttarkhana consists of 13 chapters, explains abour panchakarma procedures, netra kriya kalpas ( ophthalmic treatments etc. This work was compiled by Bhava Mishra, son of Lataka Mishra. Bhava Mishra belonged to 16th Century A.D. The Samhita covers all aspects of life science. In total, the book consists of 10,268 verses in 3 sections. Purva Khanda consists of 7 chapters, deals with origin of Ayurveda, basic principles of Ayurveda, Shareera Vignyanam etc. Madhyama Khanda consists of 71 chapters, deals with etiology, symptamatology, pathogenesis of treatment of various diseases. Uttara Khanda consists of 2 chapters, explains about Rassayana and Vajikarana. Maadhavanidhaana known as Rugvinischaya was written by Maadhavakara, who was the son of Indukara, during 7th Century A.D. it is a compilation work from earlier works such as Charaka Samhita, Sushruta Samhita, Ashtanga Hridaya etc. Maadhava has given his own special style in classifying the diseases. In his work, the pathological aspects of number of diseases has been covered. Maadhava has recognized Sula ( Colic pain) and Vispotta ( vesicles) as independent diseases for the first time. The above mentioned treatises are major works described by Ayurvedic Science.